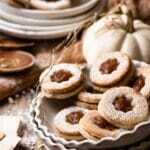 Apple Butter Sandwich Cookies made with Pumpkin Spiced Almond Cookies and Homemade Apple Butter in a Linzer Cookie Sandwich. Make Homemade Apple Butter Prior to baking cookies. Use chilled apple butter. Whisk together flour, almond meal, pumpkin spice, and salt in a small bowl and set aside. In the bowl of a stand mixer with whisk attachment, beat together butter and sugar until fluffy. Add egg and vanilla to butter mixture and mix together on medium low speed. Slowly spoon in flour mixture on medium speed until dough consistency has been formed. Remove dough from bowl and form into a ball with your hands. It may be a little sticky but just mold it into shape and don't worry it will firm in the fridge. Cut dough in half and wrap each section with plastic wrap. Place in refrigerator to chill for 2 hrs. Remove one dough half from fridge and work with your hands a few times to make it pliable. After sitting in the fridge it may be a little hard, but the warmth from your hands will make it easy to manipulate. Roll out onto a floured surface to 1/8 in. thickness. Take solid cookie cutter and cut out cookie shapes using up entire dough. These will be the bottoms of your sandwich. Place on Parchment paper lined tray and bake for 10-12 min or until lightly golden. Place bottom cookies on cooling rack. Now remove your second half of dough and repeat with large cookie cutter. Then take smaller shape and cut out the centers of each cookie. (You can keep the small center pieces and make small cookies or add them back to the scraps, roll out and make larger cookies). Be sure to bake an even number of top and bottom cookies. Once all cookies are cooled it is time to assemble. Sprinkle your top cookies without the center with a light dusting of powdered sugar. Spoon a teaspoon of apple butter onto the middle of your bottom cookies. Place the top cookie onto the apple butter.